Pets are welcome here at Cozy Creek Cottages. There is plenty of room for your four-legged family member to exercise and explore. And when you go out for the day, if you are unable to take your pet, give them the spa treatment of the pet world. We have nearby kennels that will lavish the attention they deserve. 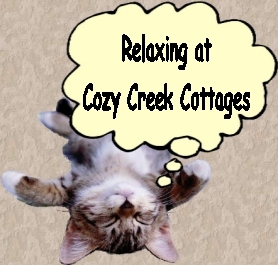 Cozy Creek Cottages has a pet fee of $40 per pet, per stay. Visiting pets should be on a leash while outside. All dog waste should be bagged and thrown in the trashcan next to your cottage. Any damage caused by a pet will be expected to be compensated. If your pet becomes sick and needs special attention the Waynesville Animal Hospital and Junaluska Animal Hospital are very close by to take care of your furry one.